June 16, 2016, 2:54 p.m.
As a part of its coverage of the EU Referendum, Politico has started to test Apple Wallet as a news distribution channel via a new tool it calls EU Referendum Tracker. With the tool, which is available only on Apple devices, readers can opt in to receive live polling and results data, as well as breaking news alerts, which appear on the back of the pass. (Politico used the tool earlier on Thursday to push out the news about the death of British politician Jo Cox following an attack.) The EU Referendum Tracker sits alongside boarding passes and rewards cards in the Apple Wallet app. Kate Day, Politico’s editorial director of growth, said Politico is using the tool to experiment with push notifications without developing and maintaining its own app. 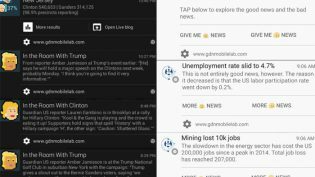 The Guardian Mobile Innovation Lab used a similar rationale for its experiments with the new notifications tools in Google Chrome. “Our hypothesis is that [users’] threshold for the number of alerts they’re willing to receive might be higher if they’ve opted in to subscribe to a particular story rather than getting general push alerts,” Day said. Why Apple Wallet, which wasn’t designed with the news use case in mind? Politico considered using WhatsApp or Facebook Messenger for its notifications tests, but neither was a perfect fit, according to Day. WhatsApp, for example, still poses a challenge for publishers looking to scale their notifications projects. And Facebook announced its news bot efforts a few weeks after Politico started developing the Apple Wallet project. The effort is a joint effort between Politico and ad agency Digitas LBI, which attempted a similar Apple Wallet news test last year to push alerts about the U.K. general election. This time around, it wanted to team up with a media organization that could help provide more data and analysis. Day agreed that Apple Wallet was an unusual choice for its project, but said that, in the end, that’s actually a good thing. “We thought Wallet was simple enough that we could effectively do this without much effort. In some ways, the limitations help us focus on what we really want to say,” she said. Bilton, Ricardo. "Politico Europe is using Apple Wallet (yes, Apple Wallet) to send readers notifications about Brexit." Nieman Journalism Lab. Nieman Foundation for Journalism at Harvard, 16 Jun. 2016. Web. 18 Apr. 2019. Bilton, Ricardo. "Politico Europe is using Apple Wallet (yes, Apple Wallet) to send readers notifications about Brexit." Nieman Journalism Lab. Last modified June 16, 2016. Accessed April 18, 2019. https://www.niemanlab.org/2016/06/politico-europe-is-using-apple-wallet-yes-apple-wallet-to-send-readers-notifications-about-brexit/.